Pictures of Hors d’oeuvres for 150 – What's for Dinner Moms? We were trying to do super inexpensive yet nice food for approximately 150 people. There were no cooking facilities there so everything needed to be made ahead of time and no real way to keep things warm we went with simple room temperature or cold foods. We cut all the vegetables, meat, and cheese ourselves to save money. I am grateful to have a wonderful spouse who graciously helped for two days get this ready. 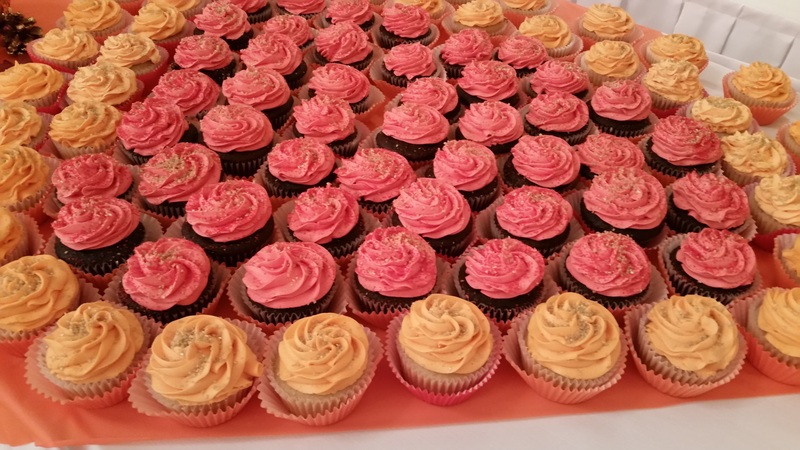 Cupcakes were donated from a local bakery, Full-Circle Cafe, and they were amazing! We made two huge vegetable trays. The colors looked lovely on the tables and they are a simple way to feed lots of people. We had extras to fill as needed but not much more was needed. 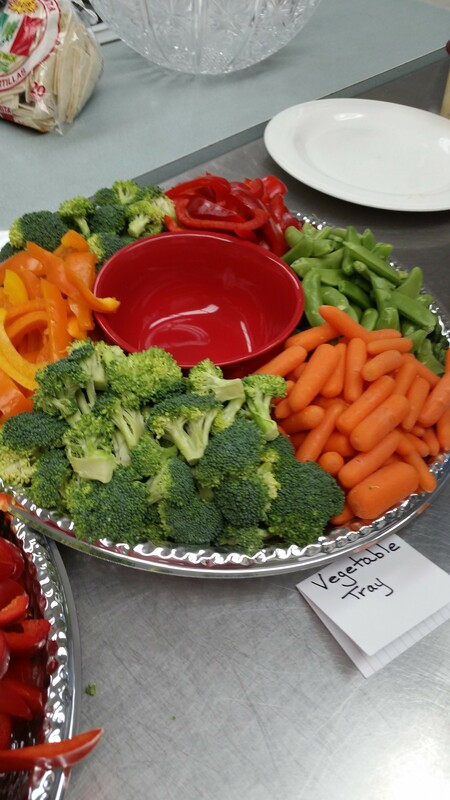 The bowls held dip for the vegetables which we played just before serving. 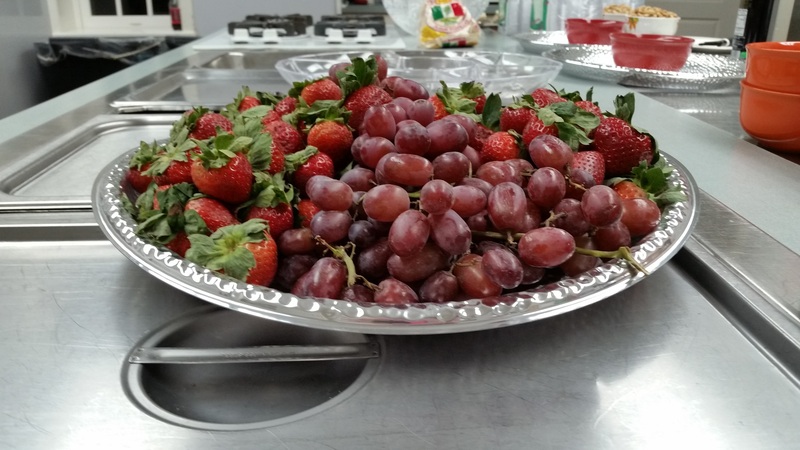 Two large trays of grapes and strawberries were very simple to put together as we didn’t cut the tops off the strawberries but rather just rinsed them. Grapes are easy to wash and plate by tearing them into small chunks. 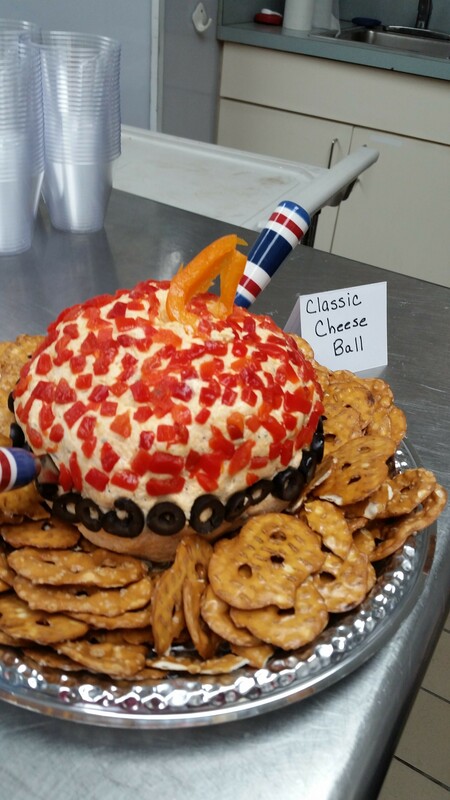 We made two giant cheese balls. These were quadruple the original recipes and then surrounded by pretzel crisps. 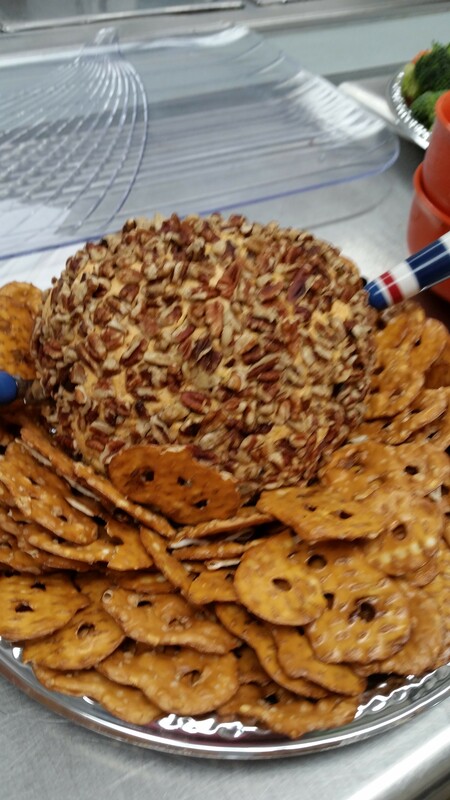 This is the Buffalo Ranch Cheese Ball and the Classic Cheese Ball is below. Add to this the items I forgot to take pictures of as it got busy. We made Antipasti Skewers, (a cube of salami, provolone cheese, and a sweet grape tomato on a small skewer with a balsamic reduction drizzle). We had 3 trays of those about 300 pieces. The trays of cream puffs and tiny chocolate eclairs which they have every year and everyone loves. These are purchased and all I had to do was thaw them before serving. This was finished with chips, salsa and guacamole donated by Moe’s. Twenty large pizzas donated by Silver Beach Pizza. There was plenty to eat and drink and I had no reason to panic. The best part was that all the paper goods were disposable so for the first time we did not need to run the dishwasher at the event. It made it so much easier. Congratulations on your successful event! Lol. Thank you. We used to throw casual sledding and Christmas parties for 100+ people although it has been 5 years it all came back really quickly. It was kind of fun but not something I wish to do regularly. Wow, awesome, Marci! I am so happy for you that all of your efforts worked out so well! Thank you, Erika! It was such a great evening for a worthy cause. I am glad everything went well for you! I couldn’t imagine prepping food that many people. Great job! Thank you! It was a family effort. You had lots of practice from all the family cabin parties. Glad it went well, but I agree — not something I want to worry about every week. Happy to hear all went well, Marci and you had some generous support to help out too! Blessings! Great ideas for prep ahead. The veggies look lovely!